I hope everyone had a great Mother's Day! I sure did! I woke up and was quickly joined by all my fur babies in bed. Taylor came in and delivered me a Starbucks. The kids and my husband went downstairs and made me Eggs Benedict and served it to me in bed. They they did my chores for me. I did nothing. It was pure bliss. Thank you Family! 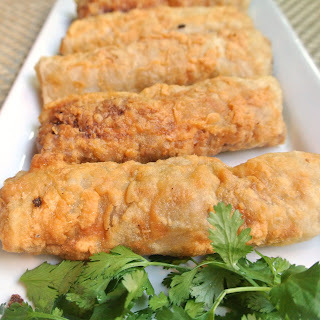 A long time ago I emailed Ramona over at Curry and Comfort and asked for some guidance on developing a gluten free egg roll. 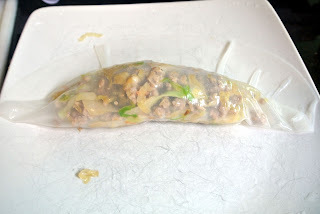 All egg roll wrappers have wheat. She was so sweet and sent me an email back with her suggestions. I kept that email all these months. Knowing I was going to make them. Just took me 6 months. My daughter says they were worth the wait. Husband and Son both agree. These were a huge hit with the Family. Taylor said they were better than the kind she used to have at her favorite Chinese Food restaurant. Thank you Ramona for your help! My Family is ready for you to move in next door now. 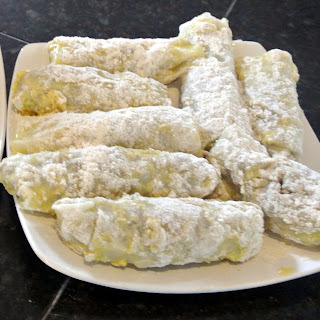 Do not get overwhelmed with the steps to this recipe. It looks like a lot, but it really isn't. Rolling them does take some time, but it is an easy task that you can have the Family help out with, if needed. I enjoyed chatting with a friend while I rolled mine. My Family let me know my efforts were worth it. 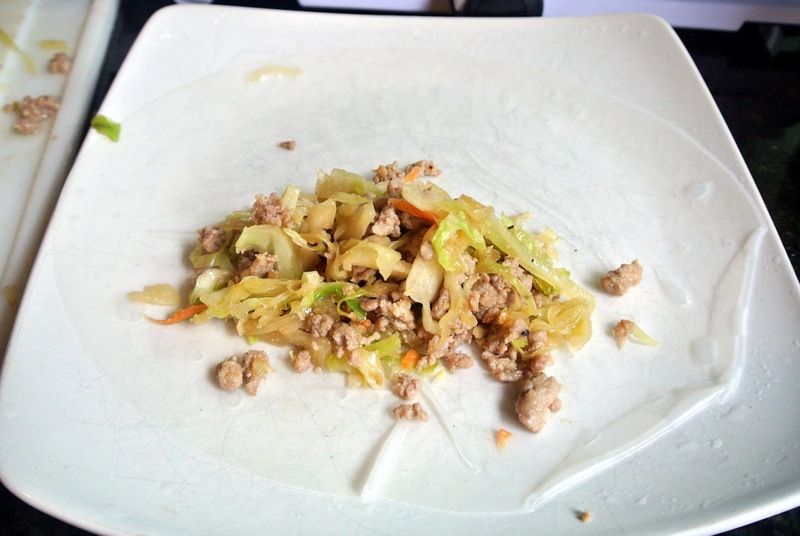 One pound of lean ground pork. 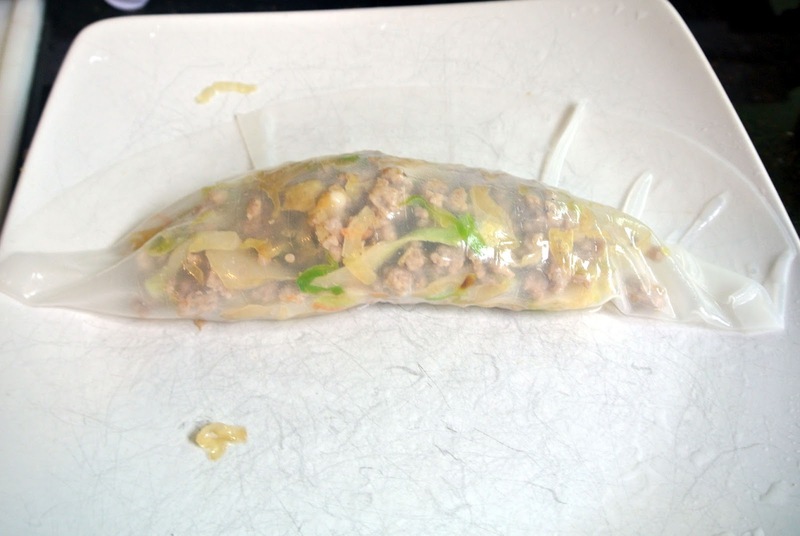 1 lb lean ground pork. Mix together and let sit for 10-15 minutes. Heat a wok or large saute pan over high heat. In 1 Tbsp of sesame oil saute' pork until no longer pink. Add chopped green onions, 2 grated carrots, 2 cups shredded cabbage, 1 Tbsp freshly grated ginger, and 2 cloves of minced garlic. Cook a few minutes until vegetables are tender. 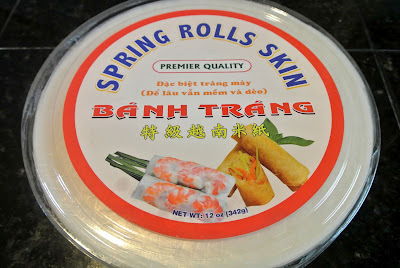 Set aside to cool while preparing Spring Roll Skins. Heat up your deep fryer to 350 degrees. If you do not have a deep fryer, add canola oil to a deep saucepan and heat to 350 degrees. 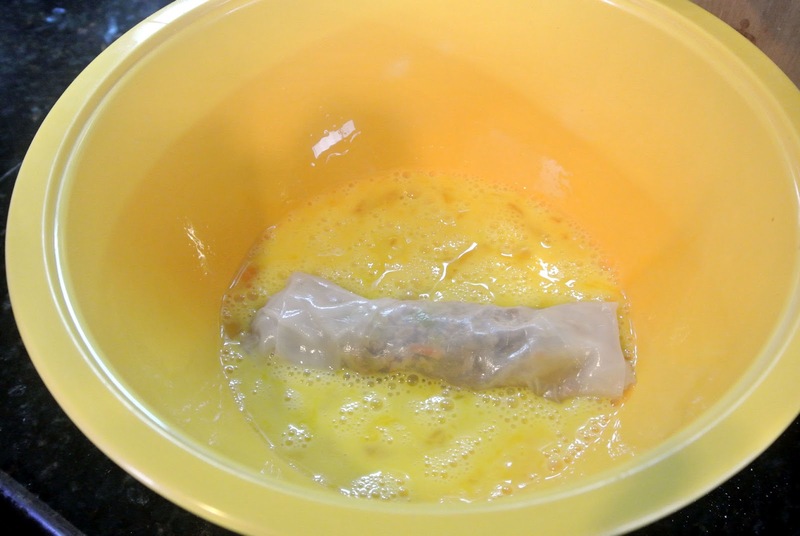 You will need to soften the spring roll wrappers in warm water prior to rolling them. You do this one at a time. Once Spring Roll paper is soft fill wrapper with 2 Tbsp of filling. Get out 2 large bowls. Crack your eggs into to one large bowl and scramble with a whisk. In the other large bowl add your 1 cup of gluten free rice flour. 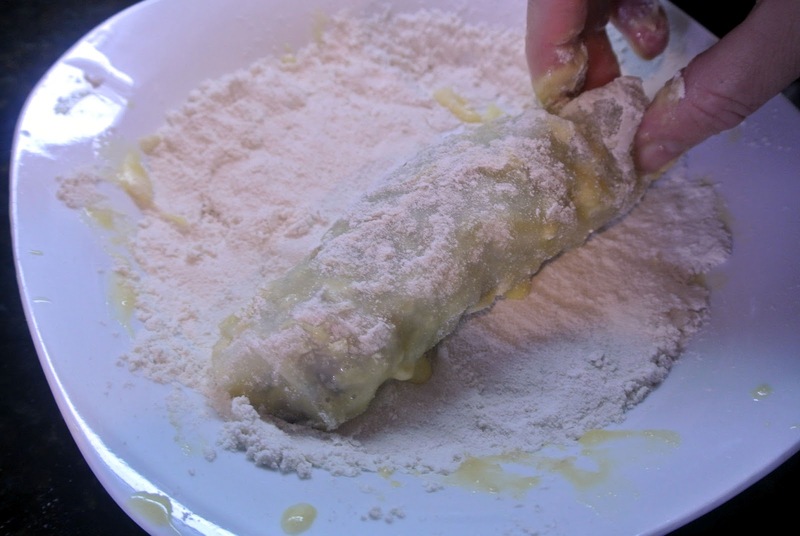 Dip the Spring Rolls in one at a time, first in the flour. Have all egg rolls done before frying. Do not lay on top of each other or they will stick together. 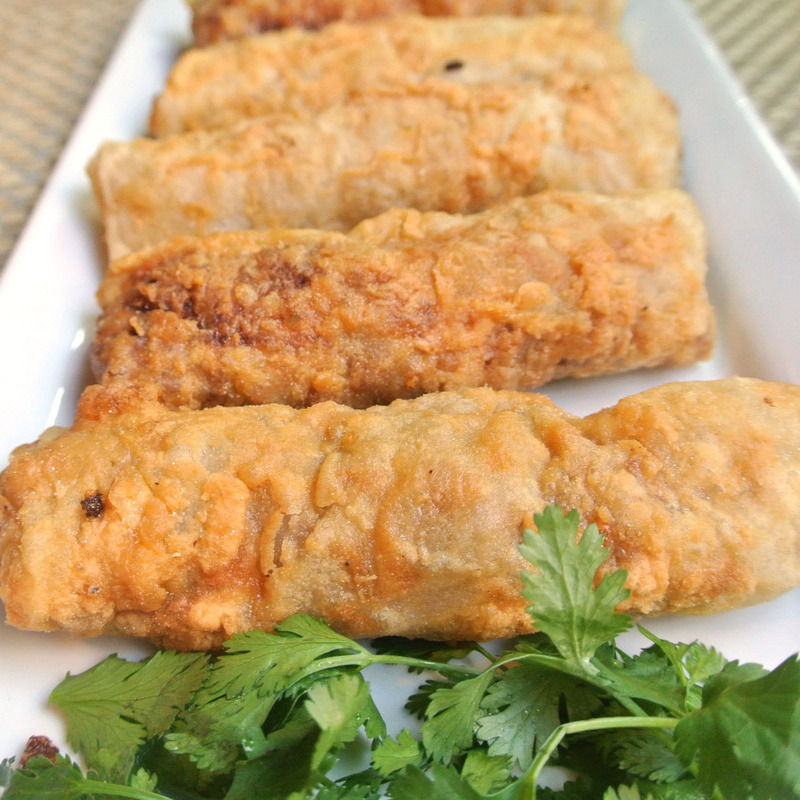 Fry each egg roll until it is golden brown. It took 5 minutes for mine. We used 3 different dipping sauces, Red Chili Sauce, Orange Glaze, and Spicy Ketchup. Gluten Free! 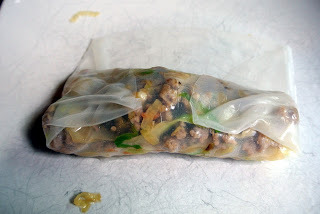 Have you tried making gluten free wonton wrappers. It's relatively easy and they work really well! I have tried and they never turn out thin enough. Hi! I was just diagnosed as a fructose malabsorber. One of the things Is can't have is wheat- so finding this gluten free blog of yours is wonderful! Unfortunately, I am one of the fructmals that reacts to corn, as well. 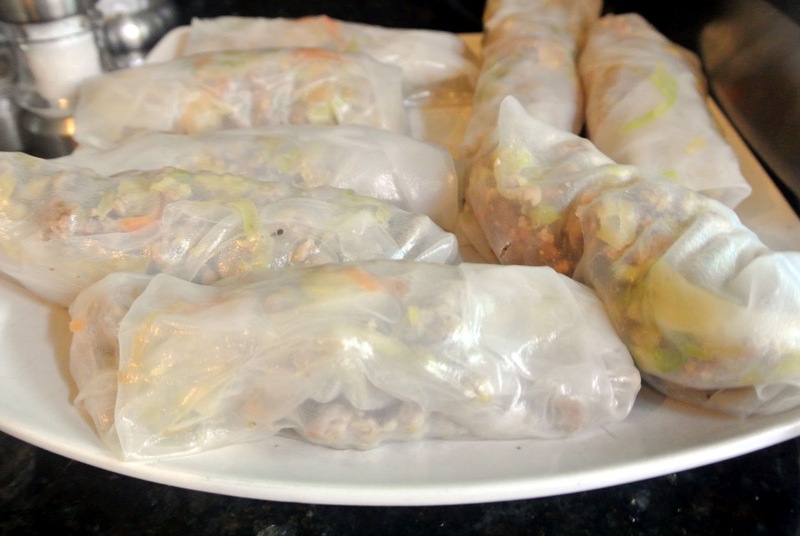 So, it is even harder to find breads, tortillas, wontons, etc.- when I saw that you used the rice paper spring rolls, I thought, "Voila! That's genius!" (I can have white rice.) Anyway, even though there are many things on your blog that I CAN'T have, there are lots that I CAN have! I'm grateful for you. I am so glad you found me! So sorry about your diagnosis, but at least now you know and can live a happy healthy life! Rice is our lifesaver too! If you ever have any questions, I am here to help!